Mol, Belgium, 29 September 2014 – The HomeTronics theatre, the first Auro-3D® equipped home theatre in the USA, received the gold medal in Technical Design & Best Overall Home Theatre award during the Electronic Lifestyles® Awards Celebration at CEDIA EXPO 2014 in Denver. The speakers of the theatre were manufactured by CAT (California Audio Technology), who were also responsible for the engineering and tuning of the theatre. “We are incredibly proud of the award for the Auro-3D equipped HomeTronics & CAT Home theatre in this most prestigious category at CEDIA. Congratulations to our friends at HomeTronics and CAT! This also shows the growing appreciation for the unmatched immersive 3D sound developed by Auro Technologies” said Wilfried Van Baelen, CEO of Auro Technologies. 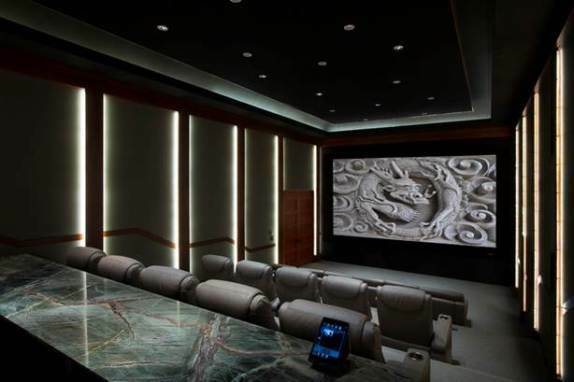 HomeTronics is an experienced team of design and installation professionals dedicated to designing and installing world class home theatres, audio/video, lighting, control and home automation systems. Utilizing key components from a select group of manufacturers, combined with our knowledge and expertise, HomeTronics designs and engineers systems with unparalleled performance and simplicity. HomeTronics designs and projects have won many national industry awards and our work has been featured in over 75 national and international publications. For more information, visit the HomeTronics website. Founded in 1990, CAT – California Audio Technology is the global engineering and custom audio manufacturing firm internationally recognized as the world’s premier craftsmen of custom ultra-high performance loudspeakers, amplifiers, DSP’s – Digital Signal Processors, loudspeaker and XLR interconnect cables. Leading architects, designers, builders and A/V integrators order custom CAT, CAT ELITE, and CAT MBX loudspeakers in any size, shape, colour or material. For more information, visit the CAT website.